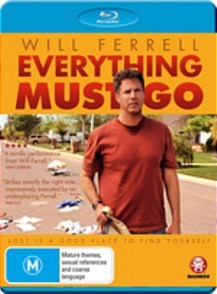 Everything Must Go Blu-ray Review Based on a short story by Raymond Chandler, Everything Must Go is a heartfelt and surprisingly touching account of a man’s attempt to claw his way up from rock bottom. Nick Halsey (Will Ferrell) is, to put it mildly, having a bad day. After being fired from his sales job due to his ongoing battle with alcohol, he returns home to find his wife gone, the locks changed and all his possessions scattered over the lawn. Furthermore his soon-to-be-ex wife has frozen his bank accounts and credit card and wants nothing more to do with him. Living (and drinking) on his front lawn soon grows old, however, and in an attempt to move on with his life Nick organises a garage sale, reluctantly selling off his possessions and, with the aid of a bored local kid and the shapely lass across the street, learning a thing or two about himself in the process. I like a serious Will Ferrell role as much as the next man, but after having seen him take a tranquiliser dart to the neck in Old School or attempting to bury John C. Reilly alive in Step Brothers I do find myself longing for more of the same from Mr Ferrell, even in the heaviest of roles. That’s not to say he doesn’t pull it off however – as in Stranger Than Fiction Ferrell handles the drama with panache, and his pain is both believable and moving. Based on a short story by Raymond Chandler, Everything Must Go is a heartfelt and surprisingly touching account of a man’s attempt to claw his way up from rock bottom. Buoyed by a strong supporting cast which includes Rebecca Hall and Laura Dern, the film is both subtle and effective, resisting cliché and injecting just the right amount of sentimentality into proceedings. It’s a deft touch from both Ferrell and director Dan Rush, and an excellent leading turn from a man not heretofore well known for his dramatic chops. A theatrical trailer and a smattering of Madman propaganda.